Helmets are extremely important for electric skaters. Electric skateboards can travel at extremely high speeds, and once you get speed wobbles it’s very difficult to recover. You’d rather not regret not wearing a helmet as you’re in the middle of falling to the ground at 20 mph, so buy and wear a helmet. There are many different helmets on the market, many designed for skating. Skater helmets generally have a basic, rounded design, but you can purchase any certified bike helmet and it will protect your head similarly. 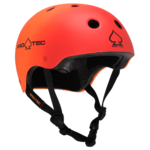 The certified Protect Classic skate helmet comes in several different colors, and meets the CPSC/CE certification requirements. It’s well designed, low profile, and comfortable to wear. You can buy the Protec Classic Skate Helmet directly from their website, or from retailers like Amazon. Make sure you purchase the “Certified” helmet– Protec also has a line of non-certified helmets that are a couple bucks cheaper, but why skimp when you’re talking about protecting your head. 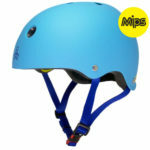 The Tripe 8 Dual Certified MIPS helmet is another popular helmet that follows the classic skate helmet look. It’s also available in numerous colors, and is dual-certified CPSC and ASTM F-1492 Skate. Tripe 8 also has a couple models that are not certified, so be sure to purchase one that is. You can purchase the Tripe 8 Dual Certified MIPS helmet directly from them. There’s a ton of other accessories you can buy to help keep you safe on your electric skateboard. Visit our accessories guide for more safety equipment and other cool accessories for your board.